Tony and I lived in Timisoara, Romania for five months in 2009, while Tony had a Fulbright at The University of the West. But I had been to Timisoara earlier. During my first Fulbright in Sibiu, Romania in 2001, I had gone to the Timisoara BAS Conference. I didn't remember too much about Timisoara from that visit (and it was before I had a digital camera so I didn't have so many pictures). But one building had stayed in my mind: the Banca de Scont. Here are some of its beauties. The Banca de Scont was built by Marcell Komor (1868-1944) and Dezso Jakab (1864-1932), two Budapest architects who had earlier worked with Odon Lechner. I tried to find out more about them on-line, but there was not a lot of infomation. I did learn that Komor died in the Holocust. Eventually I was able to learn more about their lives and their work. 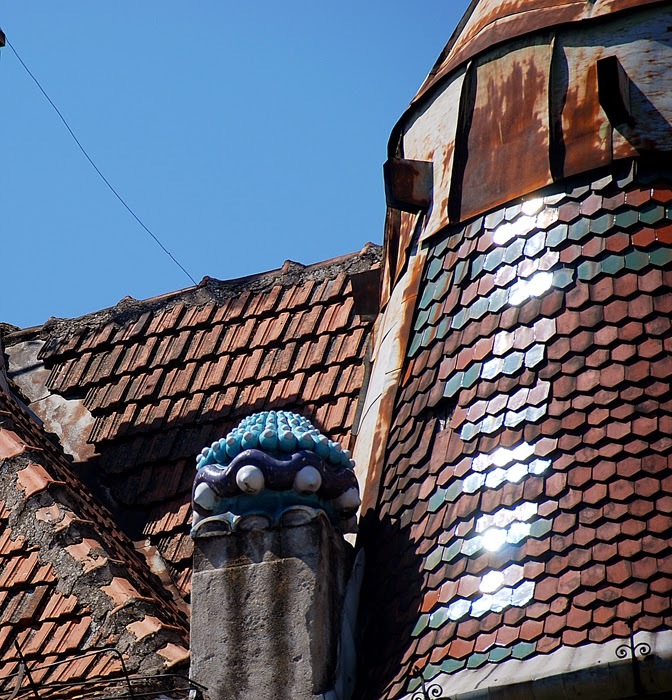 I also found out that they had designed other important buildings in Romania, including the Palace of Culture in Targu Mures and the Black Eagle in Oradea. (Much more on that to come in later blog posts :) Later I learned about their work in Subotica, Serbia (yes another blog post come on that!) And they have buildings in Budapest and Bratislava. I have subsequently gone on a quest to see as many of Komor and Jakab's buildings as I can. For some reason, I feel an almost visceral connection to them. I think part of my fascination with them are the historical ironies that surround their lives. Many of their buildings celebrate Hungarian values and ethnicity; the Palace of Culture in Targu Mures is a particularly strong example. Yet Komor was murdered because he was Jewish, and thus not Hungarian enough. But part of their appeal is the strength of their voice. Unlike some Secessionist architecture that seems rather generic, Komor and Jakab's buildings look like they created them. Their architecture is lyrical and colorful and generous in its spirit. 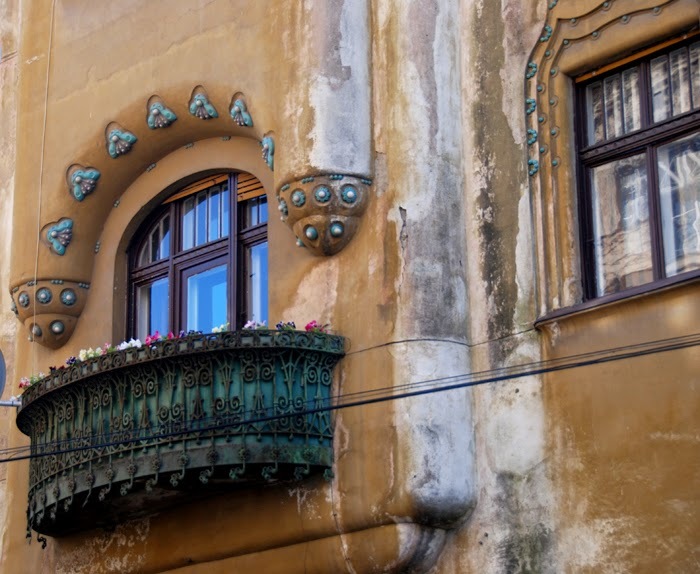 It is Timisoara that kindled my interest in Hungarian Secessionist architecture in general, and it is Komor and Jakab that helped me see some of that architecture as the work of real genius. I really enjoy your blog. Banca de Scont is extraordinary! 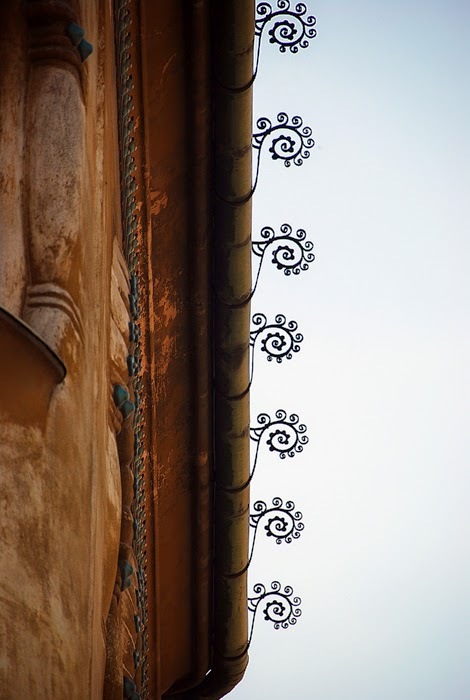 Thank you for sharing the architectural details. And thanks to Margaret Drum for leading me here. I particularly appreciate the bee hive savings bank symbolism. Thank you so much for your comment. I am really happy to introduce this beautiful building to someone who sees it's beauty. This building has led me in a quest to see as many buildings by the architects--Marcell Komo and Dezso Jakab--as I can. I have "followed" them through Romania and Serbia and now Budapest. I also love the hive symbolism. 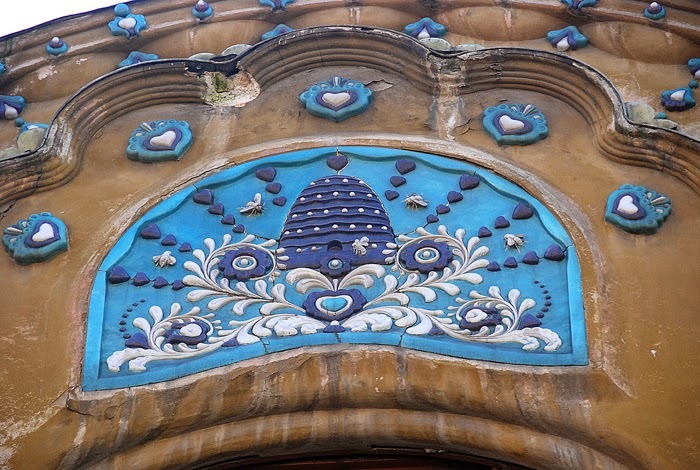 I will plan a post on Odon Lechner's post office savings bank with bees and hives. Tell Margaret thank you from me for "introducing" us.